The Miguel "Mike" B. Fernandez Family Pediatric Trauma Center at Nicklaus Children's Hospital Emergency Department is one of only two freestanding pediatric trauma centers in the state of Florida and the only freestanding pediatric trauma center in South Florida. The Trauma Center serves children from birth to under 16 years of age, with outstanding outcomes. Most patients are victims of falls or motor vehicle accidents, and have sustained fractures or head injuries. The Trauma Center currently includes four trauma treatment bays within the Emergency Department capable of treating up to 8 traumatically injured patients. Nicklaus Children's Hospital is verified by the American College of Surgeons (ACS) Committee on Trauma as a Level 1 Pediatric Trauma Center and is the only hospital in South Florida to achieve Level 1 Pediatric Trauma Center verification. The Trauma Team includes multidisciplinary healthcare professionals throughout Nicklaus Children's Hospital. The Operating Room and Recovery Room teams are often instrumental in providing life-saving and restorative treatment. The 28-bed Pediatric Intensive Care Unit provides sustained treatment and oversight for children once they are stabilized by the trauma team for patients that require intensive monitoring. In addition to the ICU and OR, inpatient medical surgical units provide care for patients that are less critical. Nicklaus Children's is home to more than 200 pediatric subspecialists representing virtually every pediatric subspecialty. Many of these physicians have national and international reputations and are available to consult in the care of complex cases. Each year the Trauma Center team hosts a reunion celebration to reunite patients with those who helped them at their time of greatest need. This popular event is held on the hospital’s main campus and features activities, refreshments and opportunities for families to renew relationships with the hospital’s extended pediatric trauma care team. 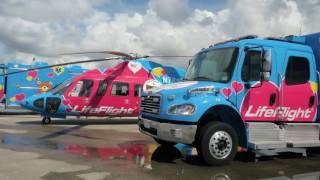 Nicklaus Children's Hospital is the Proud Lead Organization for the Miami-Dade County SAFE KIDS Coalition. The Miami-Dade County SAFE KIDS Coalition is comprised of public, private and voluntary organizations united and committed to identify and significantly reduce unintentional deaths and injuries to the children of South Florida. We respond to the needs of our community by providing professional education, practical training programs, and legislative initiatives essential to promote the safety and wellbeing of our children. Awarded Best Pediatric Emergency Room in Miami-Dade County by South Florida Parenting.